Ahh..the welcoming warmth of the mall! The eye-candy of fresh stock flaunting from the window panes! The first taste of the fury winter collection. And the shop attendants all wearing their showiest smiles and calling me by name. I hear a familiar, sweet voice, “Ma’am, I have your tea ready, one spoon sugar with a dash of milk, just the way you like it.” I’m in the mood of something else though. As I trod further, another voice beckons me, “Today’s special just for you: You only have to buy 10,000 Rs. worth of goods to be eligible for another shopping extravaganza.” And then, yet another voice, “But I have a section in my shop that just has clothes you’ve tried.” But quickly realizing that distress wont do it, “And guess what, there’s a 10% discount waiting for you, as soon as you reach your 100th item purchase.” Enough I say to myself, this dream is getting out of hand. Make it stop. So I pinch myself, but the ‘ouch’ from my mouth reveals otherwise. And then it dawns on me..maybe I’m turning into a shopaholic. Is this about the x-chromosomes taking over me or something? Maybe a deep psychological disorder manifesting?! Or, or, or, maybe its the holiday season. Yes..that seems right and simple enough. Must be the holiday season. This year, the holiday season has had an early start, esp. for the Indians. From Navratri to New Years, its been one celebration after other. And celebrations translates to parties which translates to new clothes which translates to shopping. You have to be perennially shopping for new clothes if you live in the NCR region and dare to have a social existence, where an outfit has to be donated if you are seen in it once (or been profiled with it on Facebook.). And then there are the traps of the neo-Indo womanism that further complicates dressing decisions. (It used to be so simple for our moms..the only choice they had was to wear sarees; but now we have to stock up on those as well as the entire range of options, including western wear, fusion wear, office wear, casual wear, party wear, lounge wear, summer wear, winter wear…) And if that’s not enough, the Vogues and the ELLEs introduced us to accessories. I’ve seen women at work skip lunches just so they can keep up with the shopping. I don’t blame them. What option do we have? But back to square one. Celebrations in modern India also translates to gift-giving. While some gift-giving is memorable, most of it is an exchange of excessively unneeded stuff where the only party that benefits is the retailer. How else would he be able to sell Swarovski crystal statues or Bath and Body Works fragrance oils?! About half the times, these gifts get rotated within parallel social circles. But if you apply the rule of six-degrees of separation, you should have about 1/6th chances of getting back your original gift. Hmm..I wonder whether a gift-exchange clearing house would make more sense! Well, until such a program comes to fruition, we all need to shop for gifts. For there’s no better way to express our love for each other than to give gifts. As for me, I like to start with myself, as a token of self-appreciation. Btw, one thing I’m thankful of, in the Indian context, is that the shopkeepers here don’t believe in return policies. Had they followed the Western retailers in this aspect, you could never be certain how many times your newly purchased off the rack dress would have been “on-and-off the rack”. Hey, if you dare to have a return policy in India, it could only translate to: Once you buy it, its yours until you return it. So why would you return it unless you’ve worn it once, maybe to a party, where it could have been fitted onto sweating underarms, eaten upon, smeared with..just use your imagination>. So let the western world gloat on the liberal return policies. Let us use bargaining to offset that advantage. Like true blue Indians, we reserve our right to bargain. And about 90% of the times it works. And the remaining 10% of times you are hoi polloied for having asked esp, if you happen to be at the branded shops of the SouthEx markets. But let me tell you, the embarrassment of the 10% cases has not deterred me from asking for discounts at spas, restaurants, and what the heck, even with cabs. The baniya blood in me turns a shade more red, having sealed a good bargain. Which actually brings me to my final saga in shopping. How can I write about shopping and forget about the sales? Sales are like bargain on a platter. Like having your cake and eating it too. Sales are in themselves a celebration of sorts. Tell me, has anyone complained of depression or suicidal tendencies on a ‘Black Friday’? Why die when you can buy..sort of a thing. Ok, enough morosity. Let me tell you about the funny things that happen during sales. Like I dont understand why a sales tagline “The more you buy, the more you get” is such a crowd-puller? Generally, if you buy more stuff, you’ll get more stuff, sale or otherwise. My hypothesis is that the bold and red fonts make the crowds go ga-ga. I’m pretty sure if a shop has “Reduced Inventory” and “50% Less Merchandise” in red and bold cutouts, the innocuous crowd would still flock to it. Just like every year, my gullible-self gets hypnotized by the “70% Discount” hoardings. The asterisked small fonts “on select items only” dawns on me only at the checkout counter, when I’ve been in line for 45 minutes. Anyway I can keep going on and on, but whats the point? 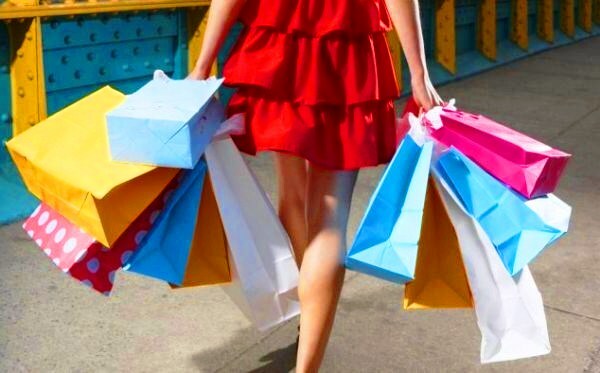 With the holiday season over soon, will the dream of turning into a full-fledged shopaholic fade away into obscurity? Or will the mind find another excuse to revive the obsession? Or will the credit card company play culprit? Only time will tell. Until then, Happy Holiday (Season).